Generating the Logo: Goto appicontemplate.com/ios8. Download the PSD template from there. The help video has the instructions on how to create and generate App Icons from it. Open the Images.xcassets file in Project Navigator (quick open by cmd + shift + O) (Fig 1 -1). It will open navigator area where all images are listed. In navigator area click “AppIcon” (Fig 1 – 2) which will show you the current app icons (Fig 1 -3). 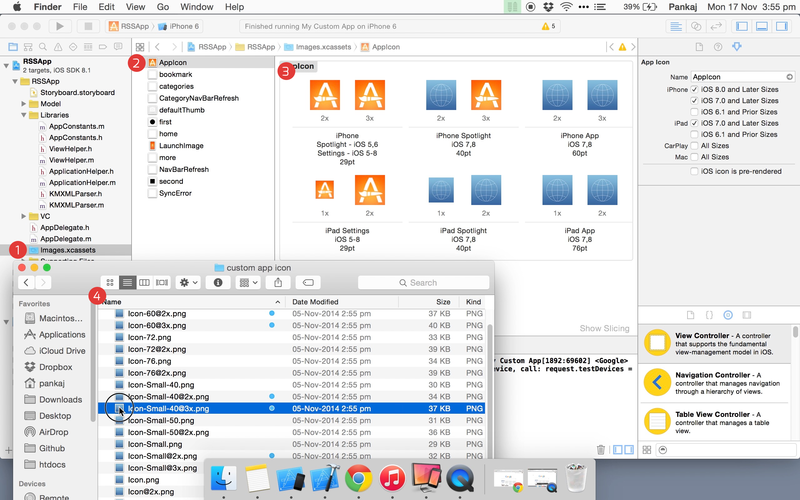 Replace them by your version of icons by dragging and dropping from finder (Fig 1 – 4). AppIcon of size 29px. Tiles labelled as 2x will have AppIcon of double the size mentioned. e.g. Tile labelled 2x under iPhone size will be 87px (29 x 3). You’ll need icons in PNG format and with these sizes to support iOS 7 and 8.